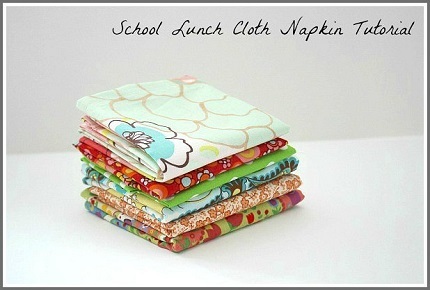 Our family uses cloth napkins whenever possible, and that includes in my daughter’s school lunches. Any cloth napkin will work for school lunches, but my daughter likes the ones that are special made just for her school lunches. Chelsey from Buggy and Buddy shares a tutorial showing how you can make fabric napkins. All you need is a square of fabric. A fat quarter will be enough to make a napkin, and since you’re not needing to make a matched set for a dining table, you can make singles. Go to Buggy and Buddy for the how-to.